I started my trip in this hostel and it couldn't have been better! 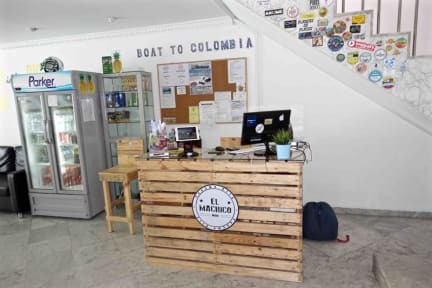 The hostel is at walking distance from good (and cheap) places to eat, they can help you book for the San Blas Islands, arrange many nice tours and breakfast is included! There is an open and nice atmosphere so I met a lot of nice people. Besides that, the hostel is very clean and they have nice and hot showers! The staff was really friendly and helpfull. I can definitely recommend this hostel, i would stay here again! They were very helpful when I had some problems with my eyes. Ask every day if i'm well or need something. Great staff! The pool, breakfast, a/c, lounge downstairs where I met amazing people made the stay very comfortable. You can find the best deals for san blas or other trips here. It's worth it! It was a really Nice hostel, i met a lot of people. The staff was really friendly and helpful. I stayed in the six bed room and it was just as you aspect from a nice hostel: clean enough. They have a lot of facilities and entertainment in and around the hostel. They can also help you book San Blas. I would highly recommend this hostel! Very Nice hostel. Clean and tidy, good staff and easy to meet people. The hostel has a nice pool, the staff is very helpful and there's definetely a good atmosphere! The bathroom's here were one of the best so far on this trip. The ac in the shared room was too much though, it got very cold at night.. Not the cheapest hostel but it's overall a good one. Good hostel! Its like 30 minutes from the old town but its a nice walk with a cool view (or you can rent a bike). Clean and lots of space tot socialize! Prima hostel, echter niet waard om een en suite badkamer te boeken. Iedereen in het hostel mag namelijk alle badkamers gebruiken. Dus er komen continu vreemden de dorm inlopen om de douche te gebruiken. Nice hostel, nothing special though. Good to stay one night in. Nice typical city hostel with a nice vibe. The pool nice of course and the dorms get cleaned every day! It’s a bit far away from the nice part of the city but a taxi is really cheap. Staff was not really assertive but they where helpful when you asked them something.